Cat declawing is frequently done in the United States. The reason is almost exclusively because cats scratch their owners' belongings. Carpet, doorframes, couches, and other furniture are all common victims of cats' need to scratch. It may seem like the natural thing to do to save your furniture and your sanity would be to have your cat declawed. It's important to understand exactly what that means for your feline friend before you subject her to it. A declaw surgery is not removing a cat's nails. In order to ensure that the claws don't simply grow back, the nail bed from which they grow needs to be permanently removed. This surgery is not the same has having your fingernails trimmed. Trimmed nails continue to grow. In order to keep the nails from constantly re-growing, the tip of the cat's digit is removed. If a human were having the same procedure, his fingers would be amputated at their first joints. You can imagine how much this would impair your ability to function and impact the way that you live. Amputation is performed with a scalpel blade or a guillotine-type instrument. This leaves a hole in the skin where the nail was, which is glued or stitched closed. The paws are usually bandaged for a day or two. As an alternative, declaw surgeries are sometimes done with a laser. In this procedure, a focused light beam is used to heat and cut the tissues, but it is still an amputation. Tendonectomy surgery is done rarely as a way to keep cats from scratching things. This procedure is not an amputation, but the tendons that a cat uses to control her claws are severed. This procedure often results in abnormal claw growth and injury to the toes when the claws become easily caught in things such as carpeting. Why Is Declawing Cats Inhumane? Declawed cats may develop a litter box aversion due to pain that is experienced during recovery from surgery. Cats normally scratch around in the litter box before eliminating, and this can be painful after being declawed. Cats may associate the pain with the litter box and begin to avoid it. Also, paper litter needs to be used in the litter box for a period of time after the surgery, and that can lead to litter box aversion, as well, because some cats don't like eliminating in the paper. Declawed cats may be more apt to bite people, especially if they are timid or shy. Without claws, these cats may feel insecure in their ability to defend themselves, increasing the chances that they may bite if they feel threatened. Declawing cats is a procedure that, except in very rare instances, is not for the benefit of the cat. Rather, it is so people don't need to worry about having their belongings damaged by scratching. Subjecting your cat to a complicated surgery with a painful recovery and potential long-term health and mental consequences is not necessary and not the right thing to do. Did you know that the Humane Society of the United States (HSUS) opposes declawing cats? So does the American Society for the Prevention of Cruelty to Animals (ASPCA). In fact, there are entire countries in the world, such as the UK, France, and Australia, where declawing cats is already illegal. Read more about declaw bans, including efforts being made in the United States to end the surgery, in the article, "Declawing Cats: Banning Declaw Surgeries." Why Do Cats Scratch, Anyway? Cats scratch to remove old husks from their nails. They also use scratching as a way to stretch and exercise all of the muscles in their back, shoulders, neck, legs, feet, and toes. 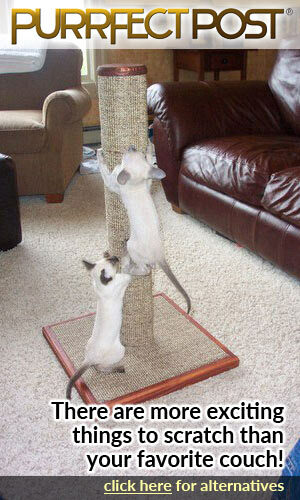 Another important aspect to cat scratching is its role in feline communication. Cat paws contain scent glands, and important messages are left for other cats when a feline scratches something. Even if there is only one cat in the household, that cat will want to leave territorial messages, just in case. What Can You Do to Deter Scratching Instead of Having Your Cat Declawed? Providing scratching alternatives and showing your cat how to use them is the primary way for you to control your cat's scratching habits. Knowing what your cat needs and wants in a scratching surface is the first step. Placing posts and scratching pads strategically around your home is another important measure. Cats love to stretch when they first wake up, so placing a scratching post near your cat's favorite resting spot is a great idea. Short, angled scratchers under the bed or in corner closets work well, and tall scratching posts with viewing platforms are beloved by cats when they are placed near windows. High-traffic areas of the home are often good spots to put scratching posts, so your cat can show off her scratching skills and also hang out with you while she enjoys a good scratch. You can learn more about how to teach your cat to use scratching posts in the article "Train Your Cat to Stop Scratching Your Couch in 7 Days or Less." Regular nail-trimming can also decrease any damage that is done if your cat does scratch at your furniture or carpeting. Nail caps can decrease the damage done to people or belongings when a cat scratches without impacting the health or well-being of the cat. You can find this excellent product, along with more information, at softpaws.com. For more information on declawing cats and why it's inhumane, visit pawproject.org.